Since al-Jazeera TV and The Guardian paper have disclosed the Palestine Papers, it seems everybody has been surprised! The majority of Palestinians, Arabs and Muslims were shocked with the level of concessions conceded to Israel, and in the West (especially Europe and the USA) they're perplexed how could Israeli refuse such a generous Palestinian offer to end the Palestinian-Israeli conflict, such as dissolving the Palestinian refugees' Right of Return, and relinquishing sovereignty over much of Haram al-Shareef and East Jerusalem! In this article, I will present analysis why we should not have been surprised; this has been predictable for a long time. Israel will be giving up sovereignty and control over East Jerusalem. "We understand Israel's demographic concerns and understand that the right of return of Palestinian refugees, a right guaranteed under international law and United Nations Resolution 194, must be implemented in a way that takes into account such concerns." Click here to read the full article. Let us be frank about this, the problem here isn't limited to Yassir Arafat, Mahmoud Abbas, Ahmad Qurai', Yasser Abed Rabbo or Saeb Erekat, the problem here that the democratic institution within the PLO body have been systematically destroyed; not only from within the PLO but also within most Palestinian political parties especially Fateh (which was the backbone of Palestinian politics). Lack of accountability within the PLO, made its leadership take the Palestinian people for granted and of course that leads to corruption and to more corruption. Let us look at the failure of the Oslo Accord as an opportunity to rebuild our democratic institutions from the ground up. Our institutions have to be accountable and transparent especially when it comes to national security matters as the right of return, compensation and Jerusalem. This failure should be the incentive to all of us (especially within the Fateh) to clean house. Would you be willing to negotiate seriously with such Palestinian negotiators who tell you one thing and tell their people a totally different thing? Would you be willing to negotiate seriously with such Palestinian negotiators who are willing to sellout cheaply the most basic of the people's rights? Such as their people's right of return and compensation. Would you be willing to negotiate seriously with such Palestinian negotiators who were thrown out of office in 2006 election? Would you be willing to negotiate seriously knowing the Palestinian people are divided? When Israel negotiates with Palestinians, it expects something real in return. Israel is willing to allow a Palestinian state in the West Bank and Gaza only when it is confident that the Palestinian people (not just their leaders) will deliver on ending the conflict once for all. Sadly, the current PLO leadership are pathetically weak and the only thing they can provide to Israeli is to become be its jailers in Palestine; what a shame; what a shame. Be free to share this article with your friends and loved ones. Our DATE is 60 years LATE, God willing sooner or later we shall return. * Salah Mansour is the founder and editor of PalestineRemembered.com, the largest Palestinian online community. Click here if you wish to leave a comment for this article. PS: Al-Jazeera English can be seen online, click here for details. PS: At most we send one email per month, however, if you wish to opt-out from our list, please click here. We support the palestanian people. Remember, Allah said in Al Quran that we (the muslims/palestanian) will win. So, dont be afraid. So, fight and syahid. Israel is a racist country that thrive on wars. Israel however, as many people think,is killing itself by itself through its ongoing racism, apartheid, ignorance, and arrogance. this racist country was installed recently since no more than 63 years ago. therefore, once can see that the age of this state is close to the age of its leaders, and 62 years is nothing in the history of nations. in addition to the above argument, accomplishing a jewish state is argued to be almost impossible. according to several statistics, the Israeli Palestinians (Palestinians lives in Israel)only by themselves, most likely, will compromise the Jewish state. of course, this analysis is apart from all other, and more influential, factors and may greatly contribute to the end of the injustice in Palestine and the return of historic Palestine. giving this context, I don't find the role of the PA is very influential in this historical context - I think they are all corrupted and running firms, the negotiations and the cause is a minor thing if compared to the business and the power they acquire from the Israelis. Thanks to the author of this article who pinpointed several truths about the corrupted PA's CEOs. They will all vanish in shame when the apartheid is over. The PA is simulating a police state, that is still under occupation, something that I've never comprehended! no one can speak, or protest- the many security forces in the PA were well trained by gen Keith Dayton, the security coordinator, I think this is shame career-end for Dayton to leave the Palestinian with plethora of security forces and mafias - following the raw model of the government forces in Egypt that everyone saw in media recently. I guess the training of Mubarak's mafias and forces were also supervised by Dayton - same school. As Haifa mentioned in her comments down, Occupations come & go, conquerers triumph & parish. History speaks for itself in this land, particularly Jerusalem. It is a holy land, and no injustice can last or thrive on its soil. Horay for the lovely people in Tunisia & Egypt ... we love the change. The PLO has always betrayed the Palestinian people and their biggest misstake was to agree to a two state solution. Zionists stole the land and created a state for foreigners in OUR LAND and kicked out 70 % of our people, and despite of this the PLO was and is only demanding back the westbank, the strip and east jerusalem? How can we only demand back 20 % from the thiefs when we are entitled to 100 %? Its time to destroy the PLO and make them pay for their crimes. As for the ONE STATE SOLUTION, i say, such a solution is not a real solution if it doesnt mean expelling each and every soul (whether jew or arab) who entered the israeli army. Nobody who served in the israeli army or in any other way worked against the Palestinian people via zionism should be allowed to be a part of the future state of Palestine who will be located in ALL OF PALESTINE and not only 20 % of it. However, the immigrated jews who did not take part in terrorism or zionism against us should be offered Palestinian citizenship. I made a perfectly reasonable comment a couple of days ago which you have not shown the honesty to publish. You are not open-minded - you are just interested in pushing your propaganda wagons. No one in Palestine right now has the right to represent me they all corrupt and shameless. please think about it, Allah says who ever puts his hand in our enemies hands while they are killing is not one of you (even though its not direct talks like hamas does). We need A new leadership that are working for the people and not for USA, Iran, UK, France or themselves. Hamas is the true representative of the Palestinian people. The Abas/PLO were in the process of transforming the occupied territories in a sort of a 'Vichi Govenrment' under Marshall Petain during WW2. (The Puppet Vichi Government at the time, was set up by the Nazis to save them occupying part of France, thus saving manpower. After liberation Petain was prosecuted and subsequent executed for high treason). They also colaborated with the Zionists and provided them with weapons from Syria (French colony). Hopefully the 'wind of change' blowing through the Arab world may change things for the better, also for the Palestinian people i Gaza and the West Bank. 1) Would you be willing to negotiate seriously with such Palestinian negotiators who tell you one thing and tell their people a totally different thing? 2) Would you be willing to negotiate seriously with such Palestinian negotiators who are willing to sellout cheaply the most basic of their people's rights? Such as their people's right of return and compensation. 3) Would you be willing to negotiate seriously with such Palestinian negotiators who were thrown out of office in 2006 election? 4) Would you be willing to negotiate seriously knowing the Palestinian people are divided? --But Abu has it wrong!!! Of course Israelis would be MORE than happy to split the Palestinian leadership from their people by exacerbating any rifts between the two. Israeli leaders WANT to negotiate with quislings. 'Divide and Conquer' is as true in the days of ancient Rome as it is today. Israel wants exactly what it's got: a divided Palestinian leadership and a dis-spirited Palestinian people! The REAL question is, "How could Abu al-Sous not see this?!" Someone finally recognizes the corruption within the Palestinian political world. Clearly, the Palestinian letters disclosed 2 things, the hidden negotiations of Saeb Erekat and crew, and the weak footing on which Palestinian negotiations are based. Do not blame the Israelis for failure, what is blatantly obvious is the unreliability of the present Palestinian representatives to deliver on their promises; promises which will never be accepted by the Palestinian people. Perhaps now, given the reference to percentages, for instance, you cite Israel still owns over 94% of historic Palestine, you will go back to 1921, when the British unilaterally gave away 73% of Palestine to the foreign Hashemite caliph. For some reason, Palestinians rejected King Hussein of Jordan's comment that Jordan is Palestine, and even with the present Palestinian majority in Rabat Amman, Palestinian politicians dare not whisper a word about the major portion of their homeland. Now is the time to confront Abdullah, and demand Palestine be returned to the Palestinians. 82. Thou shalt certainly find the Jews and those who associate partners with ALLAH to be the most vehement of men in enmity against the believers. And thou shalt assuredly find those who say, `We are Christians,' to be the nearest of them in friendship to the believers. That is because among them are savants and monks and because they are not arrogant. Isreal/USA/UK have divided Palewtinaqins and removed thgeir democratic government. Once Isreal ceases to be able to protect its citizens ie it is shown to heve military weaknesses (and that coucld happen tomorrow), even more of its citizens and its money will leave and that will pressage the end - it will have to work in a one party country or die. We support Palestinian people and boycott israel. F R E E D O M F O R P A L E S T I N A ! ! ! ! How many times will the traitors and dogs sell Palestine? When will Allah destroy them? Hasbee Allah wa na3m al wakeel! Hit abass and his cronies with your heaviest shoes on their ugly, damned, cursed faces! International support for the Palestinians is growing rapidly, as is the recognition of Palestine as a country (although the borders are not determined). In light of the atrocities committed by the IDF and the pending charges by the International Criminal court, the credibility of Israeli government has evaporated. I am an Irish American Catholic and lived through the conflict in Northern Ireland. A historic agreement was reached in 1998 and is called the Good Friday Agreement. The Good Friday Agreement effectively ended 400 years of the brutal repression of the Irish Catholics . Following the agreement, the political wing of the IRA, Sinn Fein, won many of the local elections. I believe that the next crucial step is for Hamas to follow the path of the IRA / Sinn Fein and the ANC (Nelson Mandela) i.e. enter into unconditional negotiations with the pragmatic Israelis and declare an end to armed resistance. Israelis will return to the nations from whence they came, and palestine will become the country it once was, regardless of what the world class mafia, USA newsmedia print, show and tell the world. No Matter what the demons of ignorance claim, only Truth will be all that survives the test of time. And the truth is that palestine does not belong to the israelis, even if the king of england and the united nations of NYC give it to those claiming to be jewish, coming to us from a 10,000 year old earth, flat square, the absolute center of the universe, a world where astrology is the only real science, where gold is actually worth anything, but the few industrial applications where its useful, a world where an old rabbi, chanting lost words from the kaballah over a pile of dust made the golem to do his work, and all the neighbors of a jew are either slaves, servants, hirelings or good customers until all his money is stolen, a world where women are like sheep, or cattle, one without north america, and the 10,000 native american indian tribes were treated like the palestinians, murdered and continually pushed further and further away from productive lands, and the less than 300 surviving tribes live in wastelands, off federal surplus foods. The information revolution will unite the children of our world who will unite in search for real truths, in true spirituality that equalizes all earth, the real holy land, and all the chosen ones, and their bretheren the other species. We will go back the way we came, and when we return again it will be through truth, not the lies of old preliterate scribes writing to please the king empowering his clan perpetually, keeping the world at war, with one victim fighting another, the will of kings, fueled by lust and greed, possessed by the demons of ignorance, worshiping, gold, diamonds, seeking title to perceived worlds productive assets with lawyers and judges, real criminals seeking the return of nobility hiding behind title deed, and predatory law, used to steal assets and enslave people. No Israel will not stand the test of time, Only " Truth " shall pass. And no matter how powerful they become, using misdirection and deception as their tool, the spirituality that possesses man and indeed nature, shall set things right------change or perish. "Our DATE is 62 years LATE, God willing sooner or later we shall return." I never heared that abu ammar ever wrote an artical somewhere , even if he did. The writer got only one line of it just like (o la taqrabo al salah) , and also dont forget that the article was written to ny times. Which means it was directed to ameeican people. Also. The writer whome i never heared about is asking for a country with governmental organizations , well, this is what abbas is trying to do and they are not allowing him to do (israel and people like this writer). one final comment. When abo ammar worked for oslo, he created a new place for the palestinian leadership instead of being far for thousands of kilometers back in tunisia. Oslo was just a part of the palestinian journey toward freedom and npt the last step, you need to believe in leadership and the vision, and you need to beloeve that the revolution is not only a rifle, it much much more bigger than that. grites, Gebal, Ammon and Amalek , Philistia, with the people of Tyre.Even Assyria has joined them to lend strength to the decendants of Lot.Do to them as you did to Midian . As you did to Sisera and Jabin at the river Kishon, who perished at Endor, and became like refuse on the ground.Make their noble like Oreb and Zeeb , all their princes like Zebah and Zalmunna. Who said let us take possession of the pasturelands of God...Make them like tumbleweed, O my God May they ever be ashamed and dismayed, may they perish in disgrace. Let them know that you , whose name is the Lord, that you alone are the Mosthigh over all the earth. I agree with John Somebody in his analysis. Ia addition, why are the Palestinians in in a coma? Did they go out in the steets and protest? Some facts have been bouncing around for quite some time, Abbas & his cronies are hired agents, ingratiating themselves. Did Erekat admit that the PA thugs killed Palestinians because they received oreders from Israel? Is anyone in this enligtened world doubt that USA is enemy one ? John, you are right USAID is for America to retrieve its money back, for instance the idiots of Saudi Arabia sell oil, the money must be deposited in American banks & Saudi Arabia is obligated to spen the money on weapons they have no use for or the tight training for that matter. What galls me is the deivious way to name the fleecing of other countries as USAID not criminal intenetions.The price these countries pay to be forever subservient to a world-wide mafia headed by the USA. Also, what is so disgusting is the fact that there are less than 16 million Jews around the world, only 5 million live in the US, while the Palestinian population is close to 10 million. The difference is which side the mafia is on. It is time for the Palestinians in Israel to rise up like their brothers in Tunisia, Alegeria, Jordan, Lebanon and Yemen. Iraq was a shemful collaboration of the some thuggish Iraqis who are as responsible as the US in destroying it. No theif can invade your home unless you leave a door or window open. The tragic story of Palestine of continued ivansions and conquer, but guess what the Palestinain nation is still alive and as resilient as thousands of years ago. Occupations come & go, conquerers triumph & parish. What happened to Nero, Alexander, Ponaparte, Hitler and other dictators like the Shah, Amin and Ben Ali? Maybe Israel's power is portrayed in epic proportions but its USAID someday will disappear, the USA is still bragging of its supper power status because the Americans are arrogant & dellusional they dream of eternity, but we Americans know the truth about the sliding economy, the worthless dollar, lack of jobs & opportunities. We know for a fact that we too are governed by a bunch of thugs not better that the ones we have in the ones claiming to be our representatives. Spcial thanks to Wikleaks and our brave brothers & sisters in Tunisia & Egypt, pray for us Palestinians to shake off our coma and rise. If we miss this huge opportunity we are the bitter losers! I wish yaser arafat is still around .and what wase taken by force ,you cant take it back only by force. Let us not leave the US former administrations out of this scenario and attempts to deceive the PLO and the Palestinans. Israel will never give up until they own all of Palestine (research) the Greater Israel. Both Rice and now H. Clinton have duped everyone with their one sided zionist supporting views. The US congress, Senate and literally every white house since 1948 have supported Israel with trillions of our dollars, while backstabbing any PLO leadership. Erekat and the negiotors tried in every way to make peace with Israel even giving away more and more, but nothing will satisfy the zionists...they want it all. Abbas is not even the leader of Palestine. He hasnt been elected and out of power for more than 2 years. Hamas is the ONLY democratically elected government of Gaza. Did Clinton or Rice ever visit Gaza? No, they dont want to see what our delivery of wmd has done to Gaza? The US are selling their weapons of mass destruction connected to the so called aid. Its not aid. Those billions MUST be spent on the purchase of more weapons of mass destruction. The same is true for Egypt. Those billions were supposed to go the people, they were a BRIBE to make sure the Raffah Crossing to Gaza remained closed so the Gazans would starve to death and get any basic necessities. Israel is stealing the gas and oil off the coast of Gaza..do you hear the US, UK, UN, France, Germany complain of that theft of resources. That money could be going to Gaza to rebuild after the zionists destroyed the entire strip and killed 1400 innocent women/children. The US and Israel are about to get their comeuppance. Thanks to Wiki leaks an Open Secrets all their dirty work will be known to the world. Perhaps then the US will stop its biased and unrelenting delivery of these weapons and we can have some peace in the world. How can any of this, not be secondary, if not irrelevant to the point that a state /society which depends on racist motivated murder, (also known as genocide), in order to exist, has no right to exist. The false arguements, that non - Palestinians keep falling into about one state, two states, no states, or it not being for us, to comment, is at most, a side issue, to what is NOT being talked about. 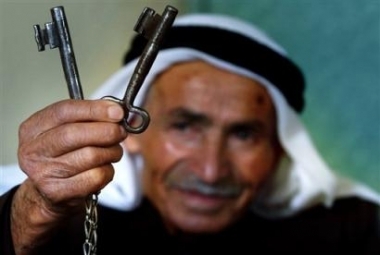 The Palestinians can't get justice in the matter of the 1948 stealing and continued holding on their land, because the Jews have virtually all the power. The Palestinians have very little leverage to get back what's been taken and there is no such thing as negotiation without leverage. What representatives of Palestinians have been willing to concede to get ANYTHING is simply a reflection of that. In the end, supposedly representative Palestinians did not sign away the Right of Return, etc. If they had, it would have been damaging, to be sure, bolstering the Jewish sense of justification in their state. But it would not have been as definitive a thing as the article treats it as being. At this point it doesn't matter much that the UN gave most of Palestine to the Jews, which it did (through duress by pro-Israel Jews). What matters more is that the Jews have the power to keep it. This power includes complicated power over Western governments and media, including those individuals who wish to enter and remain in the US Legislature. It likely also includes fostering disagreement and antipathy between Palestinians. Don't blame your fellow Palestinians. They aren't the problem. The roots of the problem are rarely addressed. Palestine was stolen from the Palestinian Arabs 1948 by the World Jewish community and the assistance of politicians in the USA and UK. All real and personal property, banks accounts, the expulsion of 800,000, and the death of many thousand took place. Since then Palestine has been a Jewish prison for the past sixty years with continuous oppression and murder. Until Palestine is returned to the Palestinian people there will never be any peace. The continued presence and interference of the illegal Israeli State that ignores numerous United Nation mandates is one of the greatest crimes on this planet, and the cause of ever incresing international friction. The Palestinian people must never allow themselves to be deluded and distracted by other issues - the real issue is 1948. Time for a ONE STATE solution. In my belief and my simple principles,these people and their boss are not Palestinians or they have some kind of drugs that made them give the land of Palestine to invaders as a gift forgetting the legal rights of the original inhabitants who are expelled out of their land by force with the dirty help of the main powers of that time espcially the British. What they did and agreed on is unbelievable and it shouldn't pass without a severe punishment.These people care only of money and nothing ,but money.God keeps you safe Palestine. Great article. About time, too. To those Palestinians not part of Fateh or any of the sellout crowd, Oslo was obviously doomed way back in the summer of 1993, before the Accords were signed. To us, there is really nothing new in the Palestine Papers.